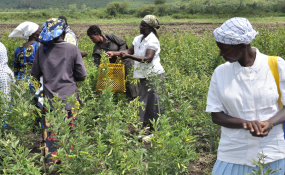 Farmers in Nyando, Kenya, have worked with researchers on a variety of promising farming practices that could improve adaptation to and mitigation of climate change. Right now, 14 million people across southern Africa face going hungry due to the prolonged drought brought on by the strongest El Niño in 50 years. South Africa will import half of its maize and in Zimbabwe as many as 75 percent of crops have been abandoned in the worst-hit areas. With extreme weather, such as failed rains, and drought projected to become more likely as a result of climate change, some farmers are already taking matters into their own hands, and pro-actively diversifying the crops they grow. According to new research from the International Center for Tropical Agriculture (CIAT) and our partners, this is precisely one of the actions that need to be taken across the whole of sub-Saharan Africa. We found that if farmers growing nine key food crops are to withstand the effects of climate change, agricultural areas need to transform - some of them very soon. "Transformation" could involve growing different crops, introducing drought or heat-tolerant varieties of current crops, or in extreme cases it could mean moving out of crop-based agriculture altogether. Our study showed that maize, bananas and beans - some of sub-Saharan Africa's most important staple crops - are under the most significant threat. Under the most extreme climate change scenarios, up to 30 percent of areas growing maize and bananas, and up to 60 percent of areas growing beans, need transformation before 2100. Some parts of the region should already be in the first stage of transformation. This includes specific pockets in highly climate-exposed and sensitive areas of Guinea, Gambia, Senegal, Burkina Faso and Niger, which are currently dependent on cereals such as maize, millets and sorghum, and legumes such as groundnuts. For other areas, action needs to be complete in the next 10 years. This includes areas in Ghana and Benin growing bananas, and maize-growing regions in Namibia, Botswana, Zimbabwe and Tanzania. Some bean-growing regions in Angola, South Africa, Uganda, Tanzania and Zimbabwe will become unsuitable by 2050 and require transformation before this time. So how can African farmers take action before these projections become a reality? Our study recommends a range of adaptation practices and technologies that can prolong the suitability of these areas for growing food crops. Producing sorghum and millet, for example, instead of maize, due to their higher resistance to drought and heat, is a possibility in some areas. But support from governments will be vital. They will need to invest in the systems producing and distributing alternative seeds, as well as in preparing processing plants, storage units and national marketing strategies that will enable the uptake of new crops. In some places action has already been taken. The Drought Tolerant Maize for Africa initiative, for example, released 160 hardy maize varieties between 2007 and 2013, and is already benefitting 30 to 40 million people in 13 African countries. In Senegal, weather forecasts for farmers now reach up to 7.4 million rural people via community radio and SMS. This helps farmers make critical decisions on their farms, such as when to plant, apply fertiliser, or weed their fields. It can be a challenge to determine the most appropriate policies to enable transformation in affected areas. For local and national level planning, there are tools available now, that help policymakers understand how to effectively and equitably allocate limited resources to the most vulnerable farmers. Climate-Smart Agriculture country profiles, that the CGIAR Research Program on Climate Change, Agriculture and Food Security has developed, are one such example. Access to adaptation finance remains critical, as well as economic incentives and robust extension services that actively involve rural people, especially women and young people. When it comes to transformation itself, this has already been successfully achieved in some parts of sub-Saharan Africa and the rest of the world. For example, parts of Central America are becoming less suitable for growing coffee due to increased temperatures and a higher incidence of pests and diseases, so farmers are switching to cocoa instead. During the drought of 2005 and 2006 in Kenya, the widespread response from pastoralists was to switch from cattle to camels, which need less water than other livestock, eat a diet of arid shrubs, and generate six times more milk than indigenous cattle. Poor markets for camel products, especially hides, are a problem. But Kenya's government is increasingly supporting the new camel keepers with restocking programmes, extension services, veterinary care and infrastructure. The images coming out of southern Africa today are alarming, and they should serve as a warning: there is still time to adapt tomorrow's agriculture for a warmer world, but only if we start now. Julian Ramirez-Villegas is a postdoctoral research fellow of the Institute for Climate and Atmospheric Science at the School of Earth and Environment of the University of Leeds in the United Kingdom. He also works in the Decision and Policy Analysis program at the International Center for Tropical Agriculture (CIAT), through a Leeds-CIAT joint position funded by the CGIAR Research Program on Climate Change, Agriculture and Food Security.